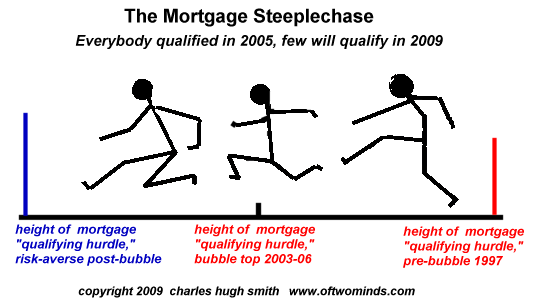 The inevitability of the housing/ leverage/speculation bubble's collapse can be illustrated by the analogy of a steeplechase in which the hurdles are lowered to near-zero: everybody qualifies, everybody wins. Surprise--everyone with a pulse and the will to lie/stretch the truth not only qualified for the "race," they all crossed the finish line with flying colors. Is there any wonder that millions of marginal buyers leaped into the race, and that their marginality was quickly revealed once they left the track and returned to real life? And now that the entire charade of passing off these millions of highly risky, doomed-to-default mortgages via securitization to unwary investors has ended, risk avoidance has led not just to a reinstatement of higher qualifying standards but a raising of the bar. So now in the post-bubble aftermath, the hurdle not only excludes the marginal risky borrowers, but some of those who might have qualified before the bubble mania infected the housing and lending markets. What this FDIC charts says is 74% of households were above poverty level at the top and 69% owned houses. The remaining 5% were either too ethical to lie/cheat their way into a huge mortgage or they were among the few remaining prudent citizens. I'm going to state various data points here; all are sourced in the above articles. The FDIC estimated 5% of home owners were marginal and would not have cleared the more strigent "hurdles" of the pre-bubble era of relative fiscal sanity. Since there were roughly 75 million homeowners (50+ million mortgages and 25 million homes owned free and clear) that means 3.75 million homeowners could not really afford to own a home. These marginal borrowers are now losing their homes. Many numbers are being bandied about, such as 2.3 million U.S. properties in foreclosure (default notices, auction sale notices and bank repossessions) in 2008 (RealtyTrac), 2.1 million foreclosures in 2008 and 1.7 million in 2007 (Moody's economy.com). Interestingly, this first wave of foreclosures aligns rather closely with the 3.75 million most marginal owners identified by the FDIC. 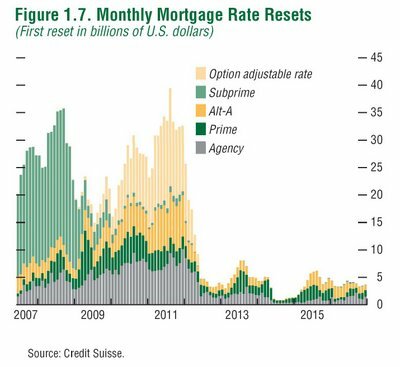 As we can see, the washout of marginal subprime borrowers is receding (the first 4 million foreclosures) but the waves of other mortgages resets is just beginning. We might also note that about 8.3 million borrowers are underwater on their mortgages, owing more than the value of their home, and depending on which projection you trust this number is on the rise to 10 million or is already at 10 million when recent declines in value are considered. These numbers suggest there are another 4 million homeowners who are at risk of default/ forclosure in the next two years. As for this being "the bottom," let's return to our steeplechase analogy. If millions of households no longer qualify for a mortgage, then who's going to be buying the 8 million houses which are in default? Yes, speculators are busy snapping up "bargains," but few seem to ask who will be buying from the speculators. The other enormous difference between the bubble peak and the present is jobs are being lost which may never come back. 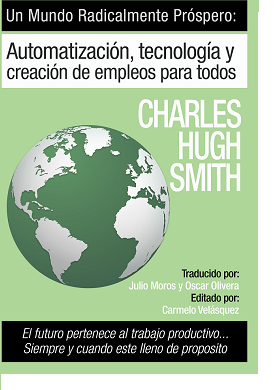 In Endgame 3: The End of (Paying) Work (January 21, 2009) I came up with a potential decline of 21 million jobs out of the bubble-peak workforce of 137 million, jobs in the FIRE ecoomy, retail and construction which aren't coming back. Let's say I'm off by a factor of two and "only" 10 million jobs are lost (or fulltime wage-earners are cut to part-time or temp), then how many households will be able to "jump" the qualifying hurdles? 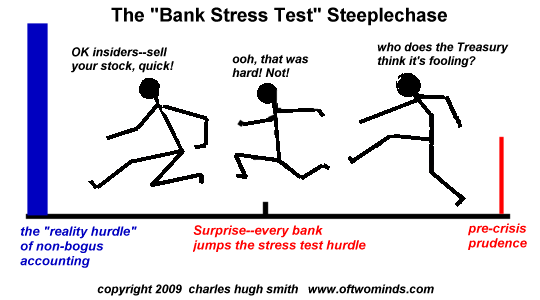 If the Treasury's phony stress test was a 6-inch high hurdle, then reality is a 10-foot high solid concrete barrier. Confidence in the truthfulness of the Treasury's stress test is essentially zero; whata bout all the off-balance sheet "assets"? What are the market values of all the toxic "assets" currently valued on what correspondent Jason calls "Hopium"--the fragile hope that a future re-inflated bubble will lift the value of worthless assets back to their bubble-era glory? You can lower the bar on borrowers and banks to near-zero to create the illusion of "qualification" or "certification" but reality remains a 10-foot high concrete barrier which the marginalized borrowers and banks have yet to face. With jobs in decline and defaults far from the end-game, clearing a 6-inch high hurdle does not mean the contestants are ready to clamber over the looming 10-foot high barrier just ahead. I think the one word that sums up this phenomena is - "Hopium"
Hope is like a drug. It's addictive and makes you feel good but in the end it's bad for you. Removal of GS people from all positions of influence and power, as well as anyone remotely connected to Goldman Sachs (GS). For a discussion on the reach of GS see 'Goldman Conspiracy:' RICO? Or Medal of Freedom? and Tremonti and Johnston do Goldman Sachs. Each time a member of Congress speaks about legislation or professes to represent the interests of the public at hearings or other events, he/she must simultaneously state any contributions received from businesses potentially affected. Obviously, there are many more, but this would be a good start. However, as I stated at the start, I believe there is little hope for reform. Sorry, America, We're Too Corrupt To Fix The Financial System. Thank you, Jason and Cheryl. Thank you, Mark L. ($35), for your most generous contribution to this site. I am greatly honored by your support and readership. Propaganda requires the active participation of a citizenry willing to be suspend rigorous skepticism in the self-serving hope that illusion can trump reality and that "others" are to blame for self-inflicted wounds. Does anyone seriously doubt that virtually every pronouncement issued by the Federal Government, local government, self-serving corporate groups and the MSM financial media is carefully crafted propaganda? Another ugly New Home Sales report: There was no statistically significant monthly improvement, as the reported change of 0.6% was within the margin of error of ±19.0%. The year-over-year data, however, was god-awful: A drop of 30.6% (±10.7%) below the March 2008 data. There is a slight silver lining in the inventory: Months supply fell to 10.7 from 11.2 — the lowest level since October 2008. The cycle high was in January 2009 at 12.5. And the absolute # of homes for sale fell to 311k from 328k to the lowest since Jan ‘02. While this is an improvement, 6 months is the 30 year average, so we still have a ways to go. And as Rex Nutting points out, even with Builders cutting prices in March, “the time it takes to sell a home rose to record high of 10.2 months.” Blame competition from cheap foreclosures, with nearly half of all existing sales distressed property. As new home sales have plummeted, we have to ask: why should we interpret a tiny blip up as anything other than a temporary pause in a relentless downtrend? With millions of existing homes sitting for sale and another 600,000 distressed properties sitting in lenders' inventories, awaiting a mythical return of a "sellers' market" in real estate, exactly why shouldn't new home sales drop to 100,000 per year or even 10,000 per year? 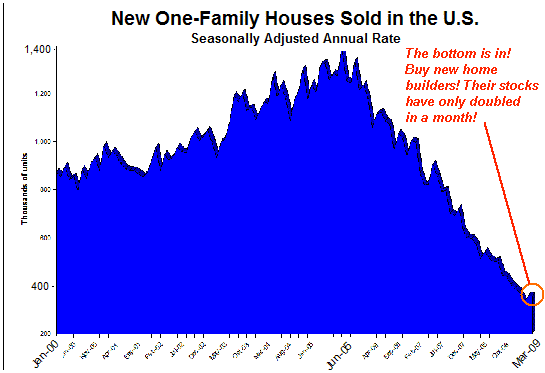 Meanwhile, the hype that "the bottom in new homes sales is in" has spurred a huge rally in national home builders, even as they continue to lose money and insiders are selling like no tomorrow--maybe because they know better than anyone that, well, there is in fact "no tomorrow" when it comes to their stock and their business. And they're not alone. Jesse at Jesse's Cafe Americain is reporting The Insiders Are Selling Into This Rally.... Heavily. New Home Sales Plummet 30%; Govt and RE Industry Spin Phony "Bottom"
What few comment on is the complicity of all who remain silent in the face of the Big Lie because they have a self-serving interest in the Big Lie's success. Everyone with a stake in housing or the stock market is hoping the 24/7 propaganda tsunami succeeds in creating a renewed surge in stocks, housing, borrowing and spending, even as they know in their hearts and in their minds it's all lies, fabrications, dissembling, distortions, manipulation and brainwashing repetition of half-truths. We all know the data is being spun so hard it's become a blur. New home sales fall from 1.4 million units a year to 350,000? Great! the bottom is in! GDP is tanking? Great! Inventories will need to be restocked soon on a gigantic scale. Ford only lost $1.4 billion last quarter? Great! It doesn't need a bailout (yet) so let's triple the stock because "the bottom is in." Like any Big Lie perpetrated by the State and a nation's Plutocracy, this requires the active complicity of the citizenry to work. Like a theft committed in broad daylight, the witnesses who turn silently away enable the crime. The game of musical chairs always offers the promise of getting out before the crowd stampedes for the last open chair. This stock market rally is a classic example: the insiders goose a phony rally ever higher, blowing through every shorts' protective stops, and then they unload at the top and go short themselves. The decline, when it kicks in, will be so sudden that no one else will be able to get short in time. It's a sucker's rally and a sucker's game, but we all play along because we're hoping to catch the top ourselves and recoup some of our stupendous losses. Nice concept, but the game is rigged. One day we'll wake up and the market will be down hundreds of points, and there will be no way to get short and profit from the plummet. That's the plan, baby, and it will be repeated in housing, bonds, etc. That's the danger of playing along with propaganda: you think its success will benefit you, but that's simply the meta-level of the propaganda: you're supposed to think the propaganda will benefit you. Only it won't; it will only benefit the State and the Plutocracy which act as two sides of the same coin. Though "propaganda" does not fully cover all that I mean by the politics of experience (which includes assumptions which are largely subconscious and subliminal, i.e. "the obvious"), it is nonetheless extremely important to understand how education actually makes one more vulnerable to carefully crafted marketing/propaganda. A classic text on the subject is Propaganda: The Formation of Men's Attitudesby Jacques Ellul. You create favorable climate for the message (called pre-persuasion). You subtly outline what picture has to be drawn in the end. Here you decide what way thoughts and perceptions of the audience will be shaped and channeled. Having established right basis for further discourse you secure the results you seek. At this stage you should identify some statements as axioms, i.e. `what everyone takes for granted' and `what everyone knows'. You attribute labels (positive or negative) to objects of further discussion, put black-or-white colors in non-disputable way. You use generalities to depict the situation - they are usually so ambiguous that you may change their meanings in the future. You use rumors and gossips. You create a 'source credibility', i.e. establish a favorable image in the eyes of the audience. The message must come from `experts' or `unbiased' and, of course, personally attractive communicators. Try to switch on the self-persuasion mechanism of the audience. You create a message that focuses the target's attention and thoughts on exactly what you want them to think about.Research has identified at least five conditions that are likely lead to heuristics. Heuristics are most likely to be used when people do not have time to think carefully about the issue, when they are so overloaded with information that it becomes impossible to process it fully, or when they believe that the issues at stake are not very important. Heuristics are also used when people have little other knowledge or information on which to base a decision and when a given heuristics comes quickly to mind as they are confronted with a problem. You create an emotion of the target that will help you channel thoughts of audience in right direction. Fear appeals are most effective when they raise high levels of fear and suggest a doable and effective response (the authors also explain why sometimes fear does not work). Guilt: once we are filled with guilt, our thoughts and behavior are directed towards ridding ourselves of this feeling that's where propagandists take advantage of us. Feeling of obligation and indebtedness: large initial request and immediate concession by the requester invokes the norm of reciprocity -we concede. Feeling of commitment based on our desire to be self-consistent. For example, to 'soften up' the target you make him involved in a much smaller aspect of the action. This serves to commit the individual to `the case'. Once people are thus committed, the likelihood of their complying with the larger request increases. Another way is to show uniqueness of the offer (scarcity sells). Use the `minimum group paradigm': You are on my side (never mind that I created the terms); now act like it and do what we say. The point here is that everyone who allows themselves to be persuaded does so out of self-interest. That's why propaganda is so effective: we all want to believe the miracle of effortless financial wealth can return. Like the South Seas Cargo Cults who tried to re-summon the fabulous offshore wealth of World War II GIs and their bases with simulacrum stone radios, we too are hoping our pleas to crudely contrived stone radios (and stone iPhones, Crackberries, etc.) will magically reinflate the bubbles just long enough so that we can exit before the crowd catches on to the con. It won't work. Magical entreaties to the Gods of Reinflated Bubbles on our stone cellphones will not create new Bull markets in stocks, housing, the FIRE economy, derivatives and fanciful debt. Stop accepting blatant financial propaganda as being in your self-interest.Stop being complicit in the lies, the fraudulent numbers, the manipulated contexts, the exaggerations, the half-truths, the distortions, the debauchery of truth and the endless spin. Every time you see a ginned-up propaganda story like New Home Sales Rose 0.6%then write the perpetrator of the propaganda calling them on it. Demand they seek to report the truth and notify them you will no longer subscribe to, read or watch their propaganda-loaded pap. Once they lose readers, they lose income--and that's as it should be. Email your representative in the satrapy known as Congress that you insist they demand real numbers and real transparency from our government or you will not only not vote for them, you will actively support their opponent in coming elections. Tell your friends and family it's all propaganda and warn them not to believe it or act on it. The banking sector is not healthy, it is not a new Bull market in stocks, housing is not coming back, borrowing $2 trillion a year is not sustainable or wise, Medicare is not safe for all time, the Tooth Fairy did not mint that quarter under your pillow, etc. Take responsibility for your own actions and refuse the temptation to blame others or institutions for lapses in your own critical-thinking and skepticism. Yes, our "leadership" (barf) and institutions have completely and utterly failed the nation. They are busy covering their tracks and evading responsibility via a 24/7 outpouring of the most desperate (and desperately obvious) propaganda. Vote down Orwellian doublespeak deceptions like California's Prop 1A, a vast expansion of taxes presented as an innocuous-sounding "Rainy Day Budget Stabilization Fund." Talk about a mockery of a travesty of a sham--the entire "revenue enhancement package" is loaded with deceptive phrases like "temporary re-alootment" oops, I mean "reallocation," "modernization act," etc., all carefully crafted to raise taxes and protect various State fiefdoms and other publicly funded elites from cuts in their rich salary, benefits and pension packages. You want a tax increase? Then start by honestly asking for one instead of trying to pull the wool over our eyes with doublespeak deception. Then describe what every State manager and employee has done to eliminate the inefficiencies, waste and petty corruptions which costs the state billions every year. Describe what every state employee, supplier and subcontractor has done to sacrifice. Remember that one day furlough a month is not a sacrifice to those facing 365 days a year on furlough. Get real and stay real with us and maybe we'd respond accordingly. Lie to us--then prepare to go bankrupt or suffer a taxpayer rebellion that makes Prop 13 look like a Sunday picnic. Phony unemployment number drops, real unemployment rises; our government lies once again. Demand the unvarnished, un-spun truth for a change; refuse to enable the Big Lies, refuse to believe the propaganda, and refuse to repeat it. Always ask: cui bono? To whose benefit? Always Always Always. Thank you, Galen W. ($50), for your stupendously generous contribution to this site. I am greatly honored by your support and readership. Not to make light of a deadly disease, but metaphorically the U.S. and global economies already have the flu. The "disease metaphor" is overused in modern-day America. Every character flaw is now a "disorder" and every series of poor daily choices excused as a "syndrome." Unsurprisingly, some costly pharmaceutical product soon pops up to sooth every "symptom" of "chronic disorder." The Fed and Treasury have pumped the patient so full of "miracle drugs" (liquidity, etc.) the stuff is oozing out the pores. But unfortunately, the global economy and its 25%-of-global-GDP component the U.S. economy still have a dogged financial flu of unknown lethality. I'd like to place this global "financial flu" in two contexts: historical and individual. The alarming qualities of this swine flu (that it has evolved to spread from human to human, that it has arisen outside of typical flu season, etc.) have triggered references to the global flu pandemic of 1918-19, just as the "financial flu" has launched innumerable references to the Great Depression of 1929, the Panic of 1907, the stagflation of the 70s, etc. Let's consider these connections in turn. To the best of my knowledge, we do not yet understand what specific elements of the 1918 flu strain's design made it so lethal to people in their prime. 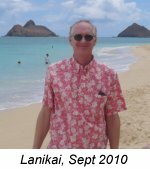 My reading on the topic suggests that its fatal qualities are not easy to identify; there is no glaringly unique chunk of DNA which stands out as "probable cause." The lethality of that strain may reside in RNA expression or other subtle processes not readily visible in standard DNA analysis. Perhaps those with deep knowledge of microbiology and immune response can provide us with a better understanding than my layman's summary. In any event, the difference between relatively benign flu's and more lethal strains is poorly understood. Despite the millions of words expended in understanding financial panics and depressions, I wonder if our understanding of the current "financial flu" is similarly incomplete. I am not a scholar of financial panics nor of the Great Depression, and hence my conclusions may well be simplistic or off-target. With that warning in mind, it strikes me that the Panic of 1907, the Great Depression and the current "financial flu" can all be reduced to rather simple "initial conditions." Pared down to fundamentals, the Panic of 1907 was essentially a sudden loss of confidence. As those with capital decided not to risk lending it, short-term interest rates shot up to extremely high levels and those who needed to roll old debt into new debt were unable to do so and as a result they were driven into bankruptcy/insolvency. 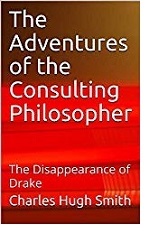 The central conceit of economics is that we can measure and quantify what Keynes labeled "animal spirits" and what the rest of us call confidence.When confidence vanishes it cannot be rebuilt in a short time; the personal analogy is betrayal or the discovery that one's spouse is having an affair. In 1907, the loss of confidence was essentially financial, and thus J.P. Morgan could assemble his colleagues and rivals and demand they step up to the plate with additional capital to calm the market's shattered nerves. This sudden loss of confidence was thus quickly restored, and those without speculative positions or large short-term debts were not heavily impacted. Put another way: those who took imprudent risks got burned. By and large, the prudent did not. The Great Depression had different initial conditions and DNA. Somewhat akin to the horrendous 1918 flu which killed healthy in-their-prime victims at higher rates than the vulnerable, the Great Depression bank closures wiped out the prudent just as effectively as it devastated imprudently leveraged speculators. 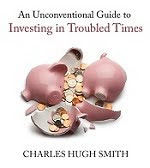 This destruction of prudently saved wealth cannot be emphasized enough.Previous financial panics did of course cause banks to fold, wiping out their prudent savers, but the main-force wealth destruction occurred in risky debt, leveraged debt and speculative instruments/financial gambles. In the Great Depression, thousands of banks closed their doors, wiping out the savings accrued by the prudent. The resulting destruction of confidence meant the prudent and imprudent alike were denied access to capital. Stripped of perhaps misleading complexities, is there any wonder why this complete betrayal of trust and destruction of prudently accrued wealth caused a lengthy Depression of "animal spirits" and a semi-permanent avoidance of risk? Put in these terms, the loss of faith in the system and the avoidance of lending/risk were entirely rational. The current "financial flu" shares two features with the The Great Depression: one is the explosive expansion of speculation, leverage and debt. For many, that is parallel enough. But it seems to me there is a key difference: unlike those destroyed by their bank's closure in the 1930s, today's prudent investor/earner is still whole. Those who prudently paid off their mortgage rather than increase it are not being foreclosed. Those who put down 30% and refused to buy in at the top may well have suffered a decline in net worth but they are not wiped out. Their small fixed-rate mortgages are far less of a burden and thus far less of a risk than large option-ARM adjustable-rate mortgages taken on at the top of the housing bubble. 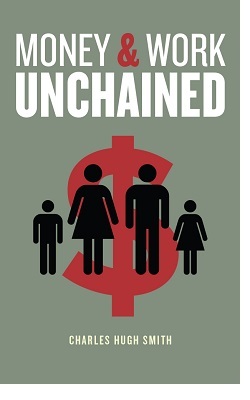 Those who prudently lived on 50% or 65% of their net income built up enough savings to give them time to fashion a Plan B when unemployment or medical catastrophe struck. Those who saw through the bogus false prosperity of this decade and the housing bubble stayed put or rented; they paid down high-cost debt with lower-cost debt but did not borrow more. Those local banks which continued prudently loaning money only to prudent, low-risk borrowers, who avoided the allure of loaning vast sums to mall developers and builders of "luxury homes" on the outskirts of town, are still whole and still well-capitalized. For a variety of cultural reasons it is somehow not quite cricket to point out that the imprudent are being wiped out while the prudent are not. Yes, wealth is being destroyed across the entire global spectrum, and those at the bottom of the heap without assets or social safety nets are suffering terribly through no imprudence on their part. 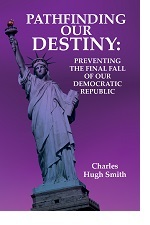 But in developed and developing economies, those who took on imprudent speculative risks and leveraged debt are being wiped out, as is the natural order of capitalism; the fatal flaw in the system is not that these excesses are being purged but that the State in all its vast powers is attempting to protect the staggeringly imprudent from the losses which are rightfully theirs. One did not have to be wealthy or a member of the Plutocracy to take on extraordinarily risky, leveraged debt, and thus it is not just the wealthy and well-connected who are suffering the consequences of imprudent bets placed at the top of speculative bubbles. Furthermore, the market should be allowed to price their remaining assets at auction, now not later. The second feature the current "financial flu" shares with the Great Depression is a systemic loss of faith in the system--for perfectly rational reasons. What makes Fed Chairman Ben Bernanke's widely touted expertise in the Great Depression especially pathetic is his inability to grasp its key driver: a rational, semi-permanent loss of confidence and faith in the financial system. The rational response to a loss of faith is to save, pay down debt and refuse the false blandishments of additional leveraged/unsecured/risky debt. What few observers note about Japan's "Lost Decade" (now roughly two decades long, but who's counting?) is that it is not only a financial phenomenon that can be massaged and tweaked by policy but a systemic loss of confidence in the entire Japanese system and economy. Those who know Japan well know all that is left unspoken out of respect and a desire to avoid loss of face: Japan has by and large refused to face the structural flaws in its democracy and economy. The policy tweaks are just that, tweaks, often hollow and for public show. Beneath the surface, the economy is esentially the same one which took shape in the post-war ruins of the late 40s, infected with many of the same elites and structures which existed before World War II. In a similar vein, Bernanke and his minions are not "saving" the U.S. financial system--they are dooming it to semi-permanent stagnation by protecting the investment banking elites from losses. That the system is rigged is now painfully obvious; that the guilty will never be prosecuted is now abundantly clear; that no real reforms will be made is now obvious, too. So exactly what rational reason does any prudent citizen have to believe the system is fair, just, transparent, an open market that establishes risk for all to judge with a system of oversight which demands equally forthright accounting from all firms large and small, etc.? Answer: none. The only prudent response to the charade of "reform" and "renewed growth" is: we don't get fooled again. Bernanke is powerless to restore confidence because his every action is designed to protect and mask the very excesses and Plutocratic over-reach which enabled and fed the financial meltdown. Rather than healing the system he is spreading the disease of no-confidence into every nook and cranny of the global economy. Now everyone on the planet knows it's all lies: the stress test, the unemployment numbers, the massaging of the Federal budget, the true size of the Fed's manipulations, the true size of the Plutocracy's stupendous systemic losses, and on and on. The great irony of the present Depression-in-the-works and the Great Depression of the 1930s is that all this debate over policy is misguided.None of President Roosevelt's policies worked, other than ameliorating the suffering of hunger via make-work and social-safety net spending. 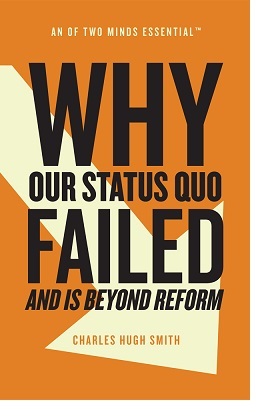 None of the policies restored "animal spirits" or faith in the system because it was still abundantly clear that the system hadn't actually been reformed or fixed. This profound loss of faith cannot be healed with bogus accounting or policy tweaks. Indeed, those scarred by the 1930s Depression never did feel comfortable borrowing vast sums of money, and many never trusted banks. The voters of Japan attempted to vote in real change in the 1990s, but their efforts were eventually stalled by the usual Powers That Be. Having failed to bring about real change, in a way democracy itself has been discredited; people just give up and make the best of what's left. I wonder if most people examine their self-talk? As we bandy about words like 'recovery' and 'recession', do we, as a majority, examine these words in any sort of meaningful context? Do we look at the charts posted on your site and others like it and think in terms of debt based economic growth and manufacturing based economic growth as a context of recovery and recession? Those charts are parabolic while "production" was minimal. In the context of debt based growth, government (which is really the taxpayer, which by the way is consumers) has stepped in to try to maintain the parabolic trajectories, and contraction is still occurring. Recovery, in the context of the current economic paradigm, is a return to parabolic growth rates of debt. The unsustainable, the imprudent and all the associated fraud has become the necessary 'norm' to which we must return. In contrast, the sustainable and prudent is now a recession that must not be allowed to happen. We have already stepped off the Orwellian cliff. If normal growth in a debt based economy means massive unemployment, and serial bubble blowing is the only way to maintain full employment, then we obviously need to reconsider our assumptions. I believe this reflects some of your ideas about scalability traps. And so I wonder, if everyone thought of 'recovery' in its true context, which is understated as "irrational exuberance", is this the course we are to pursue? And if so, what is the expected outcome? Is this psychological pattern much different from that of any other collapsed society? Everything begins with first decisions. When we embarked down the path of this experiment all answers to problems were directed toward how to make it work until it became too disruptive to change it when it became obvious that it could not work. And so, it appears that politicians adopted an attitude of "not on my watch" bubble blowing patchwork solutions instead of exercising the courage to make unpleasant decisions. Now the only way that "change" occurs is in the wake of some sort of disaster. But knee-jerk solutions are usually the wrong solution to structural deficiencies. Change that you can believe in is now at hand. It is not going to be what most expected. Swine flu as the "endogenous event"? My intuition says yes and no. No, in that it won't be decisive. Yes, in that it will pull us further toward the necessary precipice. Think about it in personal terms. I don't know about you, but my major decisions and evolutions came when my personal "swine flu" (metaphorically) mixed with other stressors to create a tipping point. Truth be told, I think people are unconsciously longing for this tipping point, even as they are consciously dreading it. Often diseases and other catastrophes provide an excuse to let go. Thank you, Harun and Zeus. I will have more to say on these topics but suffice it to say that I believe the first of several tipping points is at hand. Letting go of a failed model of "success," a failed identity and a failed financial system is painful but positive once we reach the "letting go" moment of surrender/release. Thank you, Carol W. ($20), for your much-appreciated generous contribution to this site. I am greatly honored by your support and readership. Swine Flu and The Economy: Disconnect or Tipping Point? As the mainstream media picks up the Swine Flue story, there is a weird disconnect in the financial media, which is essentially silent on the potential for pandemic to disrupt the Mexican and U.S. economies and thus the stock market. If you scan the financial news, swine flu is a non-event; it's the rear-view mirror of the (heavily massaged) first quarter GDP number which dominates the "news". I say it's massaged because the game is played thusly: a positively spun GDP number is released (it doesn't have to do anything but beat lowered expectations by .1% to work its bullish magic) and then a month or two later it is "revised downward" in a tiny news item nobody notices. Oops, that means it really wasn't so great, huh. But no matter--the "good news" has already been hyped. Isn't it rather peculiar that an unpredictable and potentially fatal flu epidemic apparently has no potential business-financial impact? What happens when Americans stop visiting Mexico? How many people are tossing aside prudence and taking the next plane for Mexico City? How many business travelers are deciding to postpone their trip to their Mexican HQ? How many people trust the Mexican authorities to 1) fully disclose the spread of the virus and 2) control a highly communicable disease in a nation with many rural areas unserved by authority or healthcare? Would you trust your health in these circumstances to any authority's calm assurances that "everything's under control"? How many enterprises in the U.S. will decide to delay trucking from Mexico? Isn't that mere prudence? And as the flu pops up in California and Texas, won't some cautious parents cancel that visit to Anaheim Disneyland? I mean, why take chances? Or is the financial media's silence just part and parcel of the usual propaganda, the dismissal of potentially negative news and the constant hyping of "good news" even if the numbers are suspect or manipulated? It seems rather obvious to me that swine flu may well have already tipped a skittish American psyche back into bunker-defense-saving mode. If you read or watch even a single news story about this flu, ignoring the most sensationalist aspects, it is still a very sobering turn of events. Let's say the blogosphere bits about it being a bioweapon are false. Nonetheless, it is worrisome that this strain has recombined features of influenza from several continents, that it has killed people in their prime, just as the 1918-1919 pandemic did, and that it is obviously highly communicable, unlike say, HIV. These are worrisome features, and caution is a highly rational response to the many unknowns we collectively face. How many people will absorb the news and decide their teens don't need to go to the mall this week, or indeed, the next few weeks, until the extent of this epidemic becomes clearer? How many people will decide it is prudent not to frequent airports, theaters, malls, concert halls, etc.? What will that do to revenues, incomes and tax receipts? 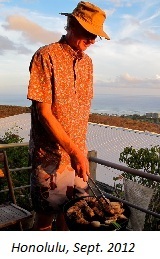 How many small businesses connected to tourism and what might be called the "animal spirits" sectors like restaurants--that is, those enterprises which depend on consumers feeling confident and ebulllient--will feel a sudden chill from this potential epidemic? How many corporate titans can look ahead and be absolutely confident that a global pandemic--even one with a low fatality rate--will have absolutely no impact on their sales, profits or operations? Consider the history of recent near-pandemics: bird flu in Hong Kong and SARS in the People's Republic of China. The authorities in Hong Kong went to extraordinary lengths to insure that every chicken in Hong Kong was killed and properly disposed of. That required a well-funded and staffed command-control structure and an authority which commanded the respect or fear of the populace, and a central authority that could order something done and actually get it done. The same was true of China and SARS. Entire cities were shuttered in a matter of hours, no questions allowed, no lawsuits, no protests--it was ordered and it was done. Can anyone seriously believe either Mexico or the U.S. has the same authority in place and the same compliant populaces as did Hong Kong and China? You can bet that if China shared a border with Mexico it would already be closed. Meanwhile, the U.S. is dithering, as if the threat is modest and easily controllable. Isn't it obvious the key driver in the decision to leave the border open is the fear that closing it would have financial/business repercussions? Profits might take a hit, for goodness' sakes, were trade disrupted. One wonders if the authorities in the U.S. and Mexico, in their urgency to calm their citizenry, are responding not to public health realities but to the financially inspired fear that any large-scale response to this potent swine flu might have undesirable financial consequences. So is acting like it's all under control taking care of the two nations' health, or the "health" of their deeply intertwined economies? Money talks and public health walks-- or so it seems at this point. While the financial media gushes over "the bottom is in" hype--earnings are up! GDP is no longer falling as fast as it was! The recession will end in 3-6 months, so jump into stocks now!--I wonder if the swine flu will tip the stock market from bullish euphoria back into fear of the unknown. It is a truism that the market hates uncertainty above all. Here the government and the media have worked overtime to establish the narrative that "the bottom is in, so buy buy buy" and this "outlier" swine flu pops up and throws a monkey wrench into this well-oiled propaganda machine. Does anybody really give a darn about the bogus "bank stress test" or retail sales if they are concerned for their kids' health? Here we have the World Health Organization declaring a "public health emergency," but the border is wide open for "business as usual," and we're all supposed to focus on Verizon's earnings or the profitable wonders of Apple's apps store? None of that matters, and it is the towering height of propaganda that the financial media is silent on the easily forseeable consequences of a swine flu epidemic, never mind a pandemic. The financial Powers That Be want very desperately for you to base your decisions on the flickering image in the rear view mirror--GDP only fell 5% instead of 6%, etc.--instead of what is buckling the road just ahead. This is not just hubris but irresponsible. The Wall Stret Journal might not breathe a word about it, but anyone with a restaurant can look ahead and feel their stomach drop. The first--and the most prudent--response to the outbreak of a disease which spreads in droplets in the air is to simply not go out. And indeed, large-scale public health studies have shown that isolating those carrying the disease is the only way to put the brakes on its spread. The public health infrastructure is the U.S. is certainly competently staffed, but I have no idea if it is competently funded. Americans might well be thinking not of their hard-working public health officials and scientists but of the Federal government's incompetence in Hurricane Katrina. Federal officials really have to get this right, and quite frankly I fear not that science won't be up to the task but that politicians won't be up to the task. I can already hear the whispered warnings being passed around the White House and Congress: the economy is in a fragile state, we don't need any upsets right now; let's be careful. Yes, let's be careful: not about the stupid economy, but about the health and safety of our citizens. The world won't end if the lumbering, hollowed-out U.S. economy spends another quarter or two in recession, but the world may well end if someone in your own family or circle of friends contracts swine flu due to the authorities' fear of "disrupting the economic recovery." Just don't expect to read anything remotely cautious in the financial media: everything's on track for a "recovery" in the stock market and everyone's bonuses, and no swine flu is going to be allowed to derail that enrichment. Thank you, Steven H. ($108), for your stunningly generous contribution to this site. I am greatly honored by your support and readership. I reprint Zeus Y. 's important essay today because it makes a critical point few emphasize--that the lies we're being told are being swallowed whole because many of us don't seem to want to know the reality looming behind the smoke and mirrors. It continues to amaze me how much people try to divert the obvious. I'm tired of people using words like "unthinkable" and "unknowable" to describe the value of CDS (credit default swaps) and now they might as well be screaming, "We don't want to know. Tell us lies, tell us whatever, just don't cause me anxiety." Am I in the minority? My anxiety disappears when I know. It's this surreal Emperor-with-no-clothes train wreck that everyone is trying to paint as a mere blip that makes no sense to me. "C'mon," I want to say. "They've already proven that they've consistently and thoroughly enriched themselves at your expense." It is central to their operation. The whole system runs on it. Do you want to continue to be taken after the con has already been exposed? How can that lessen anxiety? "Oh, I've been ripped off. They're doing the same things without any transparency or accountability. Now, I feel so much better!" It's flat-out loony. We're seeing as much a social psychological watershed moment here (as well as financial, and frankly environmental watershed). We've got to understand the benefit and joy of reality and stop with the damaging fantasies we've bought into. They don't work even when they "work". If everyone could actually be a king (instead of a sucker), the environment would collapse and we would die in a much shorter time. Consider this collapse a grace period to get our crap together and create another system. This one has proven it does not work, and thankfully, proven it before it takes out the entire globe. Thank you, Zeus. Here is his insightful essay, in case you missed it. If you reprint it or link to it, please credit it to Zeus Y. We are seeing unfold before us nothing short than the Madoffing of the U.S. financial system. The recent reports of profitability for the major financial companies—Bank of America, Goldman Sachs, Citigroup, etc. are exactly Bernie Madoff on a large scale. Here is the recipe: 1) Cannibalize incoming capital and investment to keep the bonus, fee, and salary gravy train going for broker and firm, 2) Sustain the illusion of solvency by paying dividends and claiming a profit, and 3) Ensure through accounting tricks that liabilities are never counted. It’s very easy. Hand out phony returns, based on laundered incoming bailout and investment money. Skim your take. Hide liabilities. Delude people into thinking you are profitable. Investment banks have all they need to keep the fraudulent charade going: 1) Highly fungible bailout money, much or most of which has no strings, no requirement even to notify lending authorities where the money is going. 2) The power to price assets, including so-called "toxic assets" (sic), in any way that suits them [freed from "mark to market" accounting], 3) An immense amount of greed, entitlement, opportunism, and nihilistic amorality among the leaders and managers of financial institutions, and 4) political enablement which accedes to "too big to fail" blackmail, conducts inconsequential and invisible "stress tests," and assures institutions that no matter how badly or corruptly they perform they will not be taken over. Forget that manic or addicted behavior has never been solved by enablement. Enablement, in fact, only makes the problem worse by delaying the inevitable and necessary coming to terms. This might alternatively by called the "90 trillion dollar blender" problem (www.calculatedriskblog.com). South Park did an unfortunately "truth is stranger than fiction" satire on the finance industry in which the industry leaders claimed a Margaritaville blender was worth 90 trillion dollars. FASB’s ruling allows them to do just that. If you live by the market (including wildly inflated values), then you should die by the market. Even if you feel your assets are undervalued, you should at least give an accounting as to what they are, why you think they are undervalued, and submit your reasoning to public scrutiny and debate. As far as I know there is no such requirement presently, and therefore no transparency or accountability. Banks can simply assign whatever worth is convenient for their purposes. This gets back to the counterfeiting charge I leveled against credit default swaps. This is simply phony money. If I can say my pen is worth 3 million dollars and then borrow against that to try to make a quick buck in some investment scheme, I am committing fraud. Banks do it, and they are acting legally? If past performance is any indication of future behavior, investment banks are probably right now continuing to make highly risky, highly leveraged investments to stoke their personal largesse, while hoping for a Hail Mary patch for their company’s books. These addicts won’t be kept from their crack. I know President Obama is trying with his conventional approaches to buy time, space out damage from financial mismanagement, and avoid a panic. There is probably some wisdom to that. However, trusting these companies to right their own ship after the atrocities they have consistently committed is suicidal. Why don’t we just pick off these institutions one at a time. I am almost certain that even generous stress tests have shown the major players to be insolvent. Instead of indulging in corporate welfare to bail out these crooks, force the worst in order, one by one, into receivership (with adequate time in between to absorb and reallocate assets), wipe out the stockholders and bondholders, and sell off the healthy parts. If fraud has been committed, seek criminal conviction and set up a special civil court to allow stockholders and bondholders to seek damages. This will help avoid the "Oh, crap" factor and attendant market panic. However, it will also mean we as a society will need to take the heat and full responsibility. Gray Davis, according to the documentary "Enron: The Smartest Guys in the Room," had the power to do this with Enron (go in and take them over), but he demurred, as Obama has, to the mistaken notion that private market players are always the better arbiter of the mistakes created by those same players. This protracted travesty is the logical outcome of an economy increasingly dependent upon financialization--the notion that, "Your money can work for you; you don’t have to work." Increasingly endless and abstract mechanisms must be developed to create a notion of “growth” that has lost its foundation in real productivity. Our whole economy is being kept afloat by international demand directed, at first, at our derivatives and other phony high-yield financial vehicles, and now (in a reactive spasm) conveniently directed at our "secure" bonds (which is as you noted, Charles, another emerging bubble). As long as we insist upon enabling this money-for-nothing illusion in ourselves and our financial institutions, our problems will get worse and our character will take a beating. Thank you, Marianne K. ($50), for your stupendously generous contribution to this site. I am greatly honored by your support and readership.